Earlier this month, workers broke ground on the largest Twin Cities real estate development project in two decades. Budding off a new stadium for the Minnesota Vikings, designed by HKS, locally based Ryan Companies saw an opportunity to redefine the Minneapolis neighborhood of Downtown East. Their five-block mixed-use development will include two 18-story office towers for Wells Fargo, six levels of parking with more than 1,600 spaces, about 24,000 square feet of retail space, 193 apartments and a four-acre urban park near the new stadium’s northwest corner. Wells Fargo currently has 5,000 employees scattered across more than a dozen offices throughout the area. Bordering the Mississippi River, Downtown East is already home to the Guthrie Theater, whose form mimics the defunct flour mills that comprise much of the area’s post-industrial building stock—a heritage celebrated by the Mill City Museum, also in Downtown East. And while some residential development has followed those cultural attractions, the neighborhood has so far missed out on the artistic cachet that has enlivened nearby areas like North Loop and Northeast. 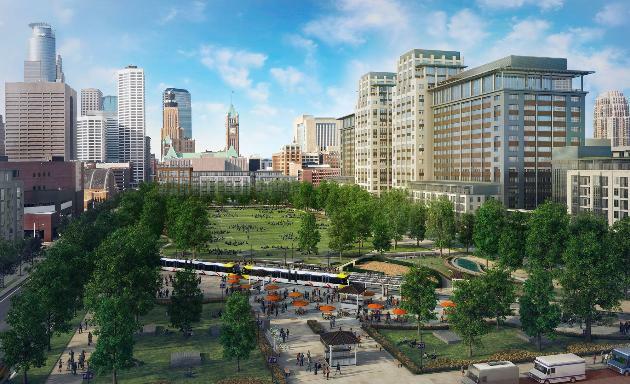 Ultimately, Downtown East is a chance to spur the development that the 31-year-old Metrodome failed to generate, said Michael Langley, chief executive of the Minneapolis St. Paul Regional Economic Development Partnership. “This is an opportunity for a huge do-over,” he said. Minneapolis has undertaken a slew of large infrastructure improvements lately, such as a revamp of downtown’s pedestrian strip, Nicollet Mall, and public transportation investments to the bike-friendly city that include a long-awaited light rail connection to neighboring St. Paul and an intermodal transit station next to Target Field.